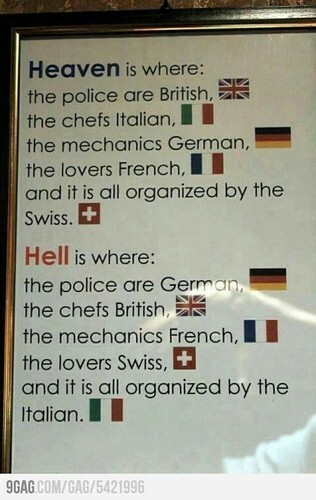 In Heaven and In Hell. It's real and it's true. HD Wallpaper and background images in the Hetalia club tagged: hetalia. This Hetalia photo might contain signe, affiche, texte, tableau noir, tableau, and affiches. If I ever get the chance to choose one, I'd like to experience trying a real Italian food by a real Italian chef. While, I think the least one I can endure is.... things being organized by Italians. I don't know. I've heard about them messing up in their economy, but I haven't heard those other countries having problems on those things that are said they are bad at. By the way, I won't mind trying British food *I'd love to actually*. O yea, and a Swiss lover.... that wouldn't be bad. So true! Btw. AWESOME PIC!! !